When He spoke, the galaxies, stars, and planets came into existence, the waters and lands were filled with lush vegetation and live creatures, man and woman were created in His image, (Gen 1:1-27). Jesus was the "Messiah." He was not a mere link in the succession of natural men, but One whom man could not, from its own sources, have designed—the perfect Man of men. His impact on the modern world is an indication of how magnificent He was. He was sent by God to save the world. All who accept Him as their Savior will receive everlasting life, (Jn 3:16). Jesus' life on earth is perhaps the most proven of all historical figures. However, the most compelling proof concerning Jesus is not found in the history of modern civilization nor even in the history of the Church, but in the succession of Christian generations of countless souls redeemed by Him. Jesus, the "Son of God, separated history and brought a new order of reconciliation by which wicked men may be made one with a merciful God. His influence spreads more and more. Absolute Hope and purpose can be found just by trusting in Jesus; only He can bring genuine peace, joy, and everlasting life. Learning to believe in Him will change your life forever. The search for Jesus is like the merchant who was looking for fine pearls, and "when he found one of great value, he went away and sold everything he had and bought it," (Matt 13:45-46). This is about a vision I received almost twenty-five years ago. God gave me this vision just to let me know He loved me! This article is in response to a prayer request by a young single mother struggling to trust in Jesus in impossible circumstances. It can also apply to single fathers. 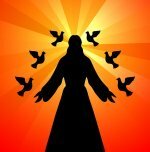 Neil's journey of salvation, sin, sickness; and, of restoration, self-forgiveness, peace, and joy. Neil says, "it's about what God can do." Are New Testament Christians required to tithe? Do you ever think about Heaven? Heaven will be more natural than life on earth. Christian Testimonial about how Satan interferes in marriages, and God brings salvation and emotional healing. Does God know about social issues? Who Is qualified to evaluate His knowledge? Is it anyone's business but His? Halima was born a Muslim but converted to Christianity after a vivid encounter with Jesus. "Teach me good judgment and knowledge: For I have believed thy commandments," (Ps 119:66). ﻿"For the eyes of the Lord run to and fro throughout the whole earth, to show Himself strong on behalf of those whose heart is loyal to Him..." (2 Chron 16:9, NKJV). "All the days of the desponding and afflicted are made evil [by anxious thoughts and forebodings], but he who has a glad heart has a continual feast [regardless of circumstances]." (Prov 15:15, AMP). Are You Trusting in Jesus?